We love playing games here, so I was excited to add Commissioned from Chara Games to our family game night selection. 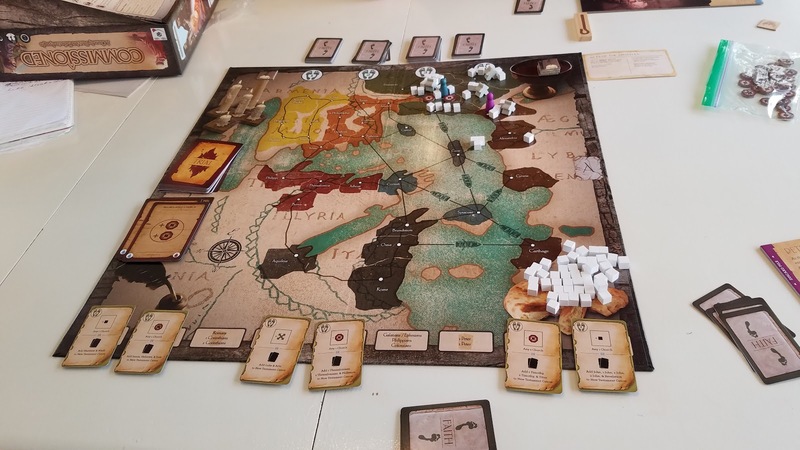 Commissioned is a historical and Biblical deck building game about the Acts of the Apostles; however, you do not need to be a Christian or know anything about Christianity or the Bible to play it! Players are early Christian apostles and work together to collect books of the New Testament, grow the people in the church, gain more faith, and overcome trials each round. It is a cooperative style board game, suggested for ages 14+. It takes about an hour to play and is designed for 2-6 players. There are five different scenarios you can play with two difficulty levels and an additional 1-versus-all challenging variation. The different scenarios have different victory conditions. The scenarios include: Acts of the Apostles, Peter's Gentle Outreach, The First Missionary Journeys, Appeal to Caesar, and To the Ends of the Earth. Each of these scenarios have a different setup and victory conditions. These scenarios cover the first 150 years of the early church! We chose to focus on learning the Acts of the Apostles scenario. There are two sides of the board and in this scenario, we used side A. There aren't any special rules and a victory means there is a church in every city and all 9 New Testament Word Cards are collected. The order of each round is ARM (draw cards) LIVE (cards are used) and MATURE (buy more cards). During the LIVE section, a trial is drawn and as a team we either defeat the trial or suffer consequences. Next, we pray by placing two faith cards down. The leader of the turn then picks and applies two faith cards to the board. We then all move and grow our church. At the end of the round we buy new cards to add to our decks to win the game. We chose to do it the "easy" way and we talked about our cards and what we should do as a team. The harder way is to roll a d8 and depending on the roll you may have to be silent and not talk about your cards. Since we were learning it I didn't want to over-complicate it. I will admit it has a bit of a learning curve. It took some time just to figure out what all the symbols mean, and some of the explanations weren't the best. However, after we played a few rounds it started to make sense and it was fun to play. Sebastian (age 9) didn't play with us, but now that we know how to play it, he could probably join in with some coaching from us. 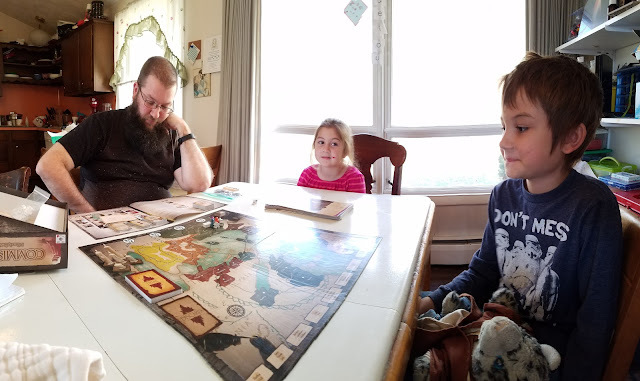 Kaelyn (age 6) is way too young to play it, but she did enjoy watching us. Overall this is a fun game. I love cooperative board games and this is one that we will keep in the rotation as a family. Although it is Christian, there is no doctrine in it so it would not conflict with anyone's personal beliefs. It is more of a historic game and even a non-Christian could play it without feeling like they are out of the loop. The artwork is nice and the instructions are decent. Even though we had a few confusing moments we were able to figure it out. My advice is to stick it out that first game to learn it. After that it is easier to play and is just a fun game for all! The kids watched us as we learned the game. How much is it and where can we get it? You can find it on Amazon for $31.24 + $5.99 shipping. We were part way through the game! Chara Games is also releasing a card game named 3 Seeds. "3 Seeds is a 30-45 minute, 2-5 player, light strategic card game. Players use seed cards (Time, Money, & Labor) to complete crops, employ special event cards to gain bonuses, and uncover hidden harvest cards to maximize their points. Remember it isn't just what you sow, it's where you sow!"